“There Is a Place” (a documentary film by Tania Ku) presented by the music therapist Lior Tsarfaty. Lior’s personal journey of discovering his gift of music as a young man and learning how to share this gift with the Alzheimer’s patients! 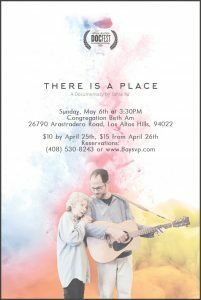 The movie captures the beauty of how music can help Alzheimer patients who are confused, lost and in deep suffering. The event includes the film, a lecture by Lior Tsarfaty, Q & A and few songs related to Lior’s work.